There are more than 50,000 OSHA recordable incidents involving “struck by falling object” every year in the United States, according to the Bureau of Labor Statistics. That’s one injury caused by a dropped object roughly every ten minutes.1 Many of these injuries are significant and some fatal. The cost of accidents and the effects on the worker and company are well documented. But what about the cost of a near miss or an incident that damages expensive machinery? A new tool has been developed to help reduce incidents of dropped fasteners and the related costs. RToddS Engineering’s patented Washer and Nut Keeper is a flexible rubber socket set that can be loaded with any combination of nuts, bolts or washers of a given size. Once loaded, the fasteners stay in the flexible socket and in perfect alignment for starting them either in a tapped hole or on a stud or bolt. The flexible socket has ribs for easy gripping. Once the fastener stack is started, the Washer and Nut Keeper is removed and the final torqueing is done with conventional sockets or wrenches. What is the cost of a dropped fastener? It could be as little as the time it takes a staff member to leave the work station and find the fastener or, if dropped in a machine such as a pump or into a process, it could be catastrophic — ruining expensive equipment or product quality. What if it was a speciality fastener and the last one on hand? Is it reasonable to risk final assembly while short one fastener, or is the project put on hold until a replacement is found? While in most cases being struck by a falling fastener isn’t lethal, OSHA calculates the direct cost to the employer for a lost time injury due to a contusion is over $27,000.1 If a worker is just one floor up and drops a fastener, it can take several minutes to retrieve the fastener and try again. Even at a total labour cost of just $50 per hour, that’s a couple dollars or more every time a nut, washer or bolt is dropped — assuming that it can be found again. 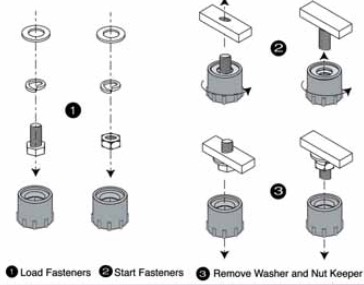 When trying to start a combination of fasteners (for example, a nut, flat washer and lock washer) in hard-to-reach locations or at an awkward work position, it’s not uncommon for there to be multiple mishaps before they are started without dropping or cross-threading them. The Washer and Nut Keeper can help solve this age-old problem, improving safety and productivity at the same time. Fasteners can be preloaded into the flexible sockets before work is started to ensure the proper sequence of fasteners and speed up site work. Gloves can be worn while using the device to reduce lacerations, which OSHA estimates the direct cost to the employer at over $19,0002 per incident. Each socket is designed with a series of cavities that securely hold the fasteners in place, and the base has an opening for a standard ratchet drive or extension. A Washer and Nut Keeper can be designed for any combination of standard, metric or speciality fasteners. A typical set of eight is a 1⁄4 inch through 3⁄4 inch set for US Standard and SAE fasteners. The Washer and Nut Keeper is protected by US patent 9,416,810 B2 and foreign patents pending. RToddS Engineering, LLC is located in Palm Coast Florida. The Principal, R.Todd Swinderman, is a licensed Professional Engineer in Florida and Illinois specializing in bulk material handling and conveyor safety training.